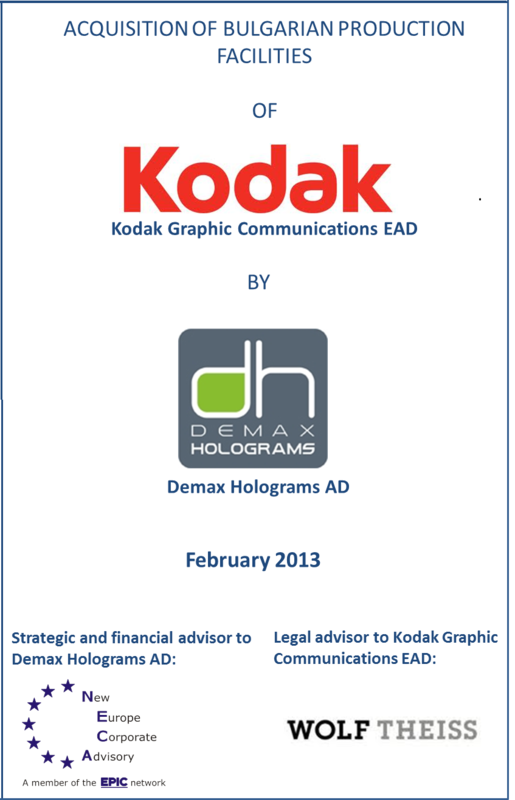 NECA acted as a buy-side advisor to Demax Holograms on the acquisition of property, plant and equipment from Kodak Graphic Communications Bulgaria. 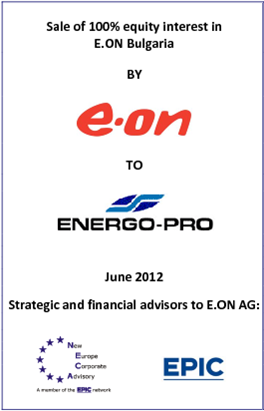 EPIC and NECA jointly acted as financial and strategic advisors to E.ON AG on the successful divestment of E.ON's 100% equity interest in its Bulgarian electricity distribution and supply business, E.ON Bulgaria EAD, to Energo-Pro a.s. of the Czech Republic. 2012 NECA acted as a buy-side advisor to Clean Energy Transition Fund for the acquisition of a 5MW solar power project in Bulgaria. NECA advised on country strategy, market survey, and transaction and financing structure. 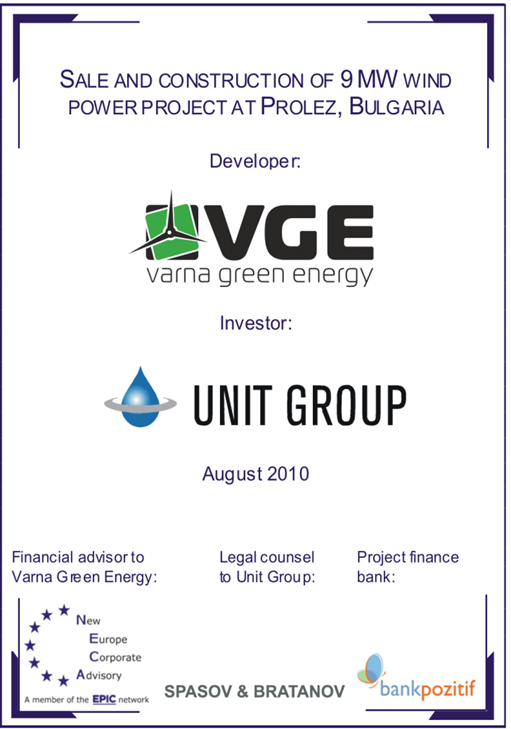 2010 NECA advised Varna Green Energy, a Bulgarian developer, on the sale of a 10.6 MW wind power project to a Turkish investor and on securing a balance-of-plant construction contract for the project. NECA did a thorough financial and organizational due diligence on one of the largest Bulgarian public construction enterprises and drafted recommendations for immediate measures to be taken for liquidity improvement and long term financial and operational performance improvement in the enterprise. 2009 Together with A.T. Kearney, NECA advised the Bulgarian State Railways (BDZ) - Passenger Transportation Ltd. on the development of an organizational structure based on a process model that will be conducive to achieving higher work effectiveness and that will be complaint with the requirements imposed on companies conducting public transportation services. NECA also assisted BDZ with the preparation of a business plan, with conceptualizing the marketing strategy of the company and with drafting a methodology for the expense allocation that were all a prerequisite for BDZ's participation in the tender for a public transportation services provider. 2009 Together with A.T. Kearney, NECA advised the Bulgarian State Railways (BDZ) - Cargo Ltd. on the development of an organizational structure based on a process model conducive to cost cutting, higher effectiveness, and better consumer service. NECA also participated in drafting the implementation strategy for the proposed changes. NECA advised E.ON on site selection and acquisition for a future planned power plant. NECA and EPIC advised a consortium of Enel and Sencap on its bid and physical and financial hedging strategy for a greenfield lignite-fired TPP in Kosovo. 2008 NECA helped EdF Energies Nouvelles with due diligence on its potential acquisition of a 22.5 MW wind power project in Bulgaria, and prepared a report on the Bulgarian renewables power market (price forecasts and overview of regulatory frameworks). Together with A.T. Kearney NECA advised a leading European producer and distributor of electricity on a major corporate restructuring of its Bulgarian subsidiary in compliance with local regulatory requirements. NECA and EPIC advised Eurohold Bulgaria on its successful acquisition of insurance company Asitrans Asigurari S.A. (Romania). The advisors were responsible for doing a market research, liaison with possible targets, valuation, due diligence support and preparation of the share purchase agreement. 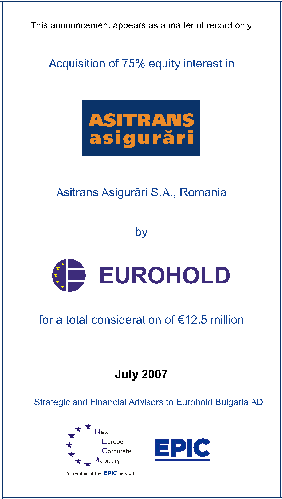 2007 NECA acted together with EPIC Romania as a strategic and financial advisor to Eurohold Bulgaria AD on the acquisition of a majority stake in the Romanian property and casualty insurance company Asitrans Asigurari S.A.
NECA, jointly with AT Kearney, advised Enel on its bid in the tenders for regional gas distribution licenses. The consortium was responsible for the preparation of the bid documentation, including business plan and regulatory financial model, as well as for the coordination of regional market studies. 2007 NECA, jointly with AT Kearney, advised Enel on its bid in the privatization of Bulgarian electricity distribution companies. The consortium's acted as economic advisor in developing the post-privatization business plan. NECA advised a major European utility on the acquisition of a 20 MW wind power project in Bulgaria. 2007 Supporting New Europe Capital Partners in ongoing pre-feasibility assessment work regarding wind power development. 2006 NECA advised the ENER-G on its bid for the privatization of District Heating Company Varna (DHC Varna). NECA was responsible for preparing a valuation model for DHC Varna. 2005 Advised Magnetic Head Technologies Bulgaria, a leading European producer of magnetic heads, on raising debt for its organic growth and acquisition of a major competitor in the UK. 2005 NECA and EPIC, jointly with A.T. Kearney, advised a ENEL S.p.A. in its bid in the privatization of Bulgarian power generation companies (TPP Varna, TPP Bobov Dol and DHC Russe). NECA acted as the regulatory and market consultant for the client with its scope covering regulatory framework, fuel and power market analysis. 2004 NECA advised a consortium of New Europe Capital Partners and Reform Capital on a bid for 104 MW of hydropower assets in Bulgaria. 2004 NECA and EPIC advised Dalkia International on bidding in the privatization of DHC Pleven. NECA's scope involved advice on bid strategy and deal structure, regulatory financial modelling and valuation as well as lobbying and due diligence coordination. 2004 NECA and EPIC, jointly with A.T. Kearney, advised Enel S.p.A. on its bid in the gas distribution license tenders for the Trakia Region and the West Region. The consortium was responsible for the preparation of bid documenta-tion (including business plan and regulatory financial model), and for coordination of regional market studies. 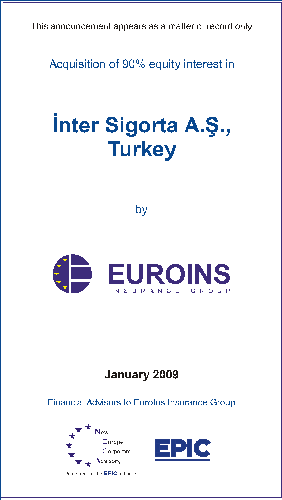 2003 NECA supported the State Energy and Water Regulatory Commission with pre-transaction advice, analysis of other countries' experience in gas distribution licensing and liberalization and prepared a strategy for the retail gas market development as part of the World Bank sponsored project Bulgaria: Development of Natural Gas Networks. 2004 Successfully consulted Neterra on finance raising for building a cross-border terrestrial network. Neterra is a leading Bulgarian alternative communications operator offering international satellite & terrestrial connectivity. 2004 NECA and EPIC successfully advised AMGA (Italy) and its Bulgarian subsidiary Black Sea Technology Company on acquiring gas distribution licenses for Moesia Region and Dobrudza Region. NECA led the overall bid preparation process, including coordination of market studies, business plan development, regulatory financial modelling and lobbying and positioning for the client. 2003 Advised Castel on a business development project.